It doesn’t matter if you’re an experienced runner who regularly competes, or are just starting to get into fitness, it’s essential that have the right running clothing and gear. You don’t need to be spending ridiculous amounts, but by having at least the basic items, your runs will be much more comfortable. Wearing the correct gear can also give you those small gains that lead to faster times. So, what are the essential pieces of equipment and clothing that runners needed to make sure are in their wardrobe? All you need to get started as a runner is a high-quality pair of running trainers that correctly fit your feet. Whether you only go on one run a week, are attempting to complete a virtual challenge, or are preparing for a marathon, a decent pair of trainers is a must. Wearing the wrong type of shoe, or one that doesn’t exactly fit, is likely to cause pain, discomfort and injury. However, you shouldn’t just pick a trainer because of the brand, price or because you like the style and design, and you certainly don’t need to buy the most expensive pair you see, the trainers you purchase need to be right for you and your running style. We strongly advise visiting a dedicated running shop, where an expert will be able to guide you through the different options. They’ll evaluate your foot and running style, and recommend the trainers best suited to your characteristics. The best running trainers provide a solid level of support and cushioning and can make a huge difference to your performance. Investing in a good pair is a smart idea that will help prevent injuries and make for more comfortable runs. You don’t need to buy an entire new wardrobe of running clothes, but there are a few items that you may want to consider adding to your collection. Avoid wearing cotton fabrics whilst running as once it gets wet, it stays wet and becomes rather uncomfortable. They’re slightly more expensive, but clothes made out of technical fabric with synthetic wicking material is a far better choice. It will keep you dry and warm in the colder months, will wick the sweat away from your body and help prevent chafing on hot weather runs. Technical fabrics also hold up much better through use and washing cycles than training clothes made of cotton. 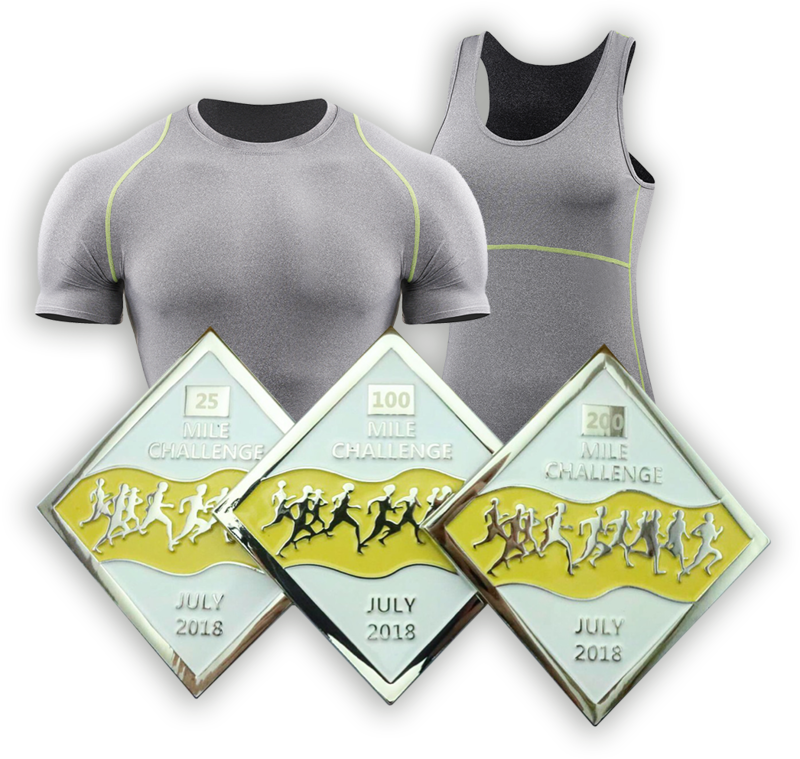 When you complete a virtual challenge with Race at your Pace, you’ll receive an awesome compression top as well as a medal! They’re good quality sports clothing and can be worn for a wide range of activities. Performance running tights comprised of highly-elastic fabric can be particularly beneficial during the colder months. Not only do they help to keep you warm, but with high elasticated panels at your thighs and knees, they also cushion your joints and cut down muscle fatigue. The heavier your clothing, the slower you’ll run, so always look to wear particularly light clothing when training and competing. It lets you move freely, is more comfortable (especially when tackling longer distances) and keeps you cooler. We highly advise against wearing 100% cotton socks when going for a run as it prevents moisture from your sweat getting wicked away. Synthetic blend running socks are a much better option. They help to prevent blisters from developing and alleviate the stress put on your calves, ankles and foot muscles. These items aren’t essential, but are nice additions that may enhance your performance. If you’re wanting to time yourself and keep improving on your PB, or you regularly race, you definitely need a watch. It doesn’t need to be expensive, just a comfortable one that has a stopwatch feature is sufficient. However, there are watches available that measures your heart rate and tracks your sleeping pattern. There’s no need to purchase an all-singing, all-dancing watch if you don’t plan to use the watch too often. If you’ll only be using it for two short runs a week, there’s little point making a leap into a higher price range. However, if you’ll be wearing it daily for every workout and keep it on for the rest of the day to make use of its non-running features, it’d be worth buying a more expensive watch. Not everyone prefers to run with their phone on them, but it can be a good idea to have it with you if you’re wanting to listen to music or take pictures whilst on your run. However, rather than carry it in your hand throughout your run, make use of an arm band. It can also be a good idea to download a running app to track and measure your runs. Strava, for example, is a freemium app that tracks your running and riding with GPS, as well as your heart rate and elevation. It doesn’t matter if you regularly race at meets, or if you’re only just getting into fitness, our virtual challenges of varying distances are a great way for people of all ages and abilities to enjoy running. Get in touch with us today to find out more!